Blogposts » Infographic on the Economics of Brexit: A Lose-Lose Proposition? 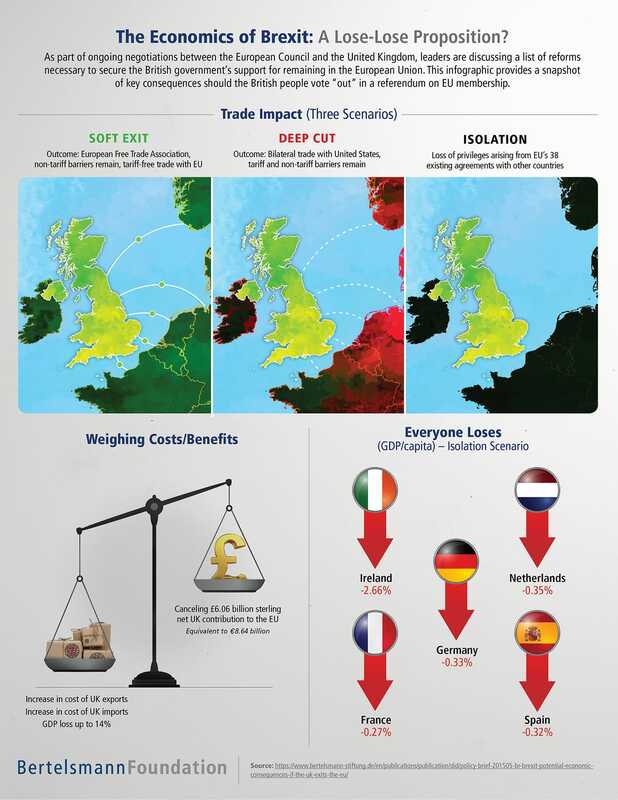 Infographic on the Economics of Brexit: A Lose-Lose Proposition? As part of ongoing negotiations between the European Council and the United Kingdom, leaders are discussing a list of reforms necessary to secure the British government’s support for remaining in the European Union. If the United Kingdom (UK) exits the EU in 2018, it would reduce that country’s exports and make imports more expensive. Depending on the extent of trade policy isolation, the UK’s real gross domestic product (GDP) per capita would be between 0.6 and 3.0 percent lower in the year 2030 than if the country remained in the EU. If we take into account the dynamic effects that economic integration has on investment and innovation behavior, the GDP losses could rise to 14 percent. In addition, it will bring unforeseeable political disadvantages for the EU – so from our perspective, we must avoid a Brexit. Download above this infographic, which provides a snapshot of key consequences should the British people vote “out” in a referendum on EU Membership. Analysing the dynamic effects of a possible Brexit once again shows that a British withdrawal from the EU would have negative economic consequences for all 28 EU countries, especially for the UK itself. Why the so called “Brexit” would be bad for the United Kingdom – or: why you can’t have the cake and eat it!